The Frick Art & Historical Center in Point Breeze will undergo a multi-phase, $15 million renovation and expansion that includes a new orientation center, education center and community center. A groundbreaking ceremony will be held June 6. 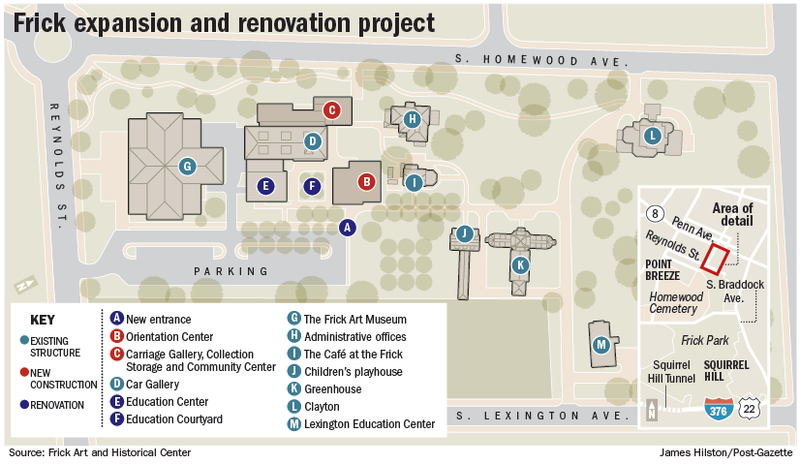 In addition to the new centers, the Frick will also expand storage facilities and children’s exhibitions and programs. The programs will make use of the playhouse, which was constructed in 1897 for the Frick children and includes a bowling alley. It currently serves as a gift shop and visitor center. Visiting the Frick Art & Historical Center, including Clayton, the home of Henry Clay Frick and his family, has been a longtime tradition among Pittsburgh residents, attracting more than 125,000 visitors each year. The exquisite landscape and rich history also make the 5.5-acre campus a popular attraction for weddings and large parties. After Helen Clay Frick’s death in 1984, the 23-room elegant home she lived in during her childhood was restored and opened to the public in 1990. The family’s collection of art, cars and carriages are on display, offering a glimpse into the life of the wealthy Frick family and educating visitors about Pittsburgh’s early role in the automobile industry. Frick director Bill Bodine anticipates the project will be complete by mid- to late 2015. One potential roadblock is the hefty cost of the project. To date, $6.5 million has been raised or pledged, Mr. Bodine said. The Burke Foundation, the center’s board of trustees, the Grable Foundation and the Richard King Mellon Foundation have made major contributions. There was also 100 percent staff participation in the campaign, adding $60,000 toward the project, he said. This project was put on hold in 2008 because of the downturn in the economy. But in 2011, the Frick hired Schwartz/Silver Architects, a Boston-based firm, and Loysen + Kreuthmeier Architects, a company based in Garfield, to begin designing the new buildings and renovations, Mr. Bodine said. Mr. Bodine realized years ago that a problem existed with the visitor experience with one glance into the parking lot. He said that when guests pull into the parking lot of the art and historical center, they often end up standing around for quite a while next to their cars because they are confused about where to proceed. Karen Loysen of Loysen + Kreuthmeier Architects joked that guests currently need “a trail of breadcrumbs” to even find the visitor center. In the new 3,000-square-foot orientation center, staff members will immediately explain to visitors what they will see at the site and why, Mr. Bodine said. The orientation center was specially designed to integrate with the existing landscape, Ms. Loysen said, accomplished with high-transparency glass walls that help orient visitors to the layout of the site. 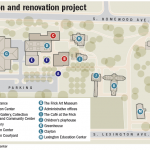 The second phase of the construction will involve transforming the current carriage gallery into an education center. The carriage gallery will be moved to a space adjacent to the car gallery, Mr. Bodine said. This education center will feature staff offices, expanded classroom space and a luncheon area for education program participants, said Greg Langel, Frick’s media and marketing manager. The expanded storage space will allow all collections to be brought back from off-site locations, which Mr. Bodine said is important because objects will be available for the staff to use to help better educate visitors. The community center, which will provide program space and create a venue for rental space, is part of the third phase of construction, Mr. Bodine said. The architectural team of Loysen + Kreuthmeier has spearheaded efforts to guarantee all project phases meet LEED standards, Ms. Loysen said. In leading the charge for sustainability, the architects will ensure that energy costs are down and the buildings are easy to maintain. She said her design team made sure to plan to preserve the site’s beautiful landscape. In fact, an asphalt plaza will be turned into a green space, the hope being that visitors can sit outside on a sunny day and enjoy the site’s grounds. The center’s neighbors in the East End have been in discussion with staff for years about this expansion project, Mr. Bodine said. One of those East End residents, Democratic mayoral nominee Bill Peduto, said he passes by the Frick Art & Historical Center at least once a week. Mr. Peduto said preserving the landscape of the site was critical because it helped maintain the integrity of the residential area. Between the concert series and programs offered, those in the neighborhood use the site for more than just the museum, Mr. Peduto said. For Mr. Bodine, this project has been a dream for the past 11 years he has served as director.